↑ "Population Census 2001 – National and county data – Summary Data". Nepszamlalas.hu. http://www.nepszamlalas2001.hu/eng/volumes/06/00/content.html. 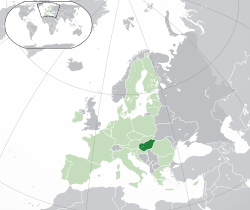 ↑ 4.0 4.1 4.2 4.3 "Hungary". International Monetary Fund. http://www.imf.org/external/pubs/ft/weo/2011/02/weodata/weorept.aspx?sy=2010&ey=2016&scsm=1&ssd=1&sort=country&ds=.&br=1&pr1.x=71&pr1.y=19&c=944&s=NGDPD%2CNGDPDPC%2CPPPGDP%2CPPPPC&grp=0&a=. Retrieved 15 December 2011. ↑ Bos, Stefan (29 May 2010). "Oban Become PM for Recession Hit Hungary" (in English). VOA News.com. Voice of America. http://www1.voanews.com/english/news/europe/Orban-Becomes-PM-for-Recession-Hit-Hungary-95186109.html. Retrieved 2010-05-30. This page was last changed on 25 November 2014, at 14:45.